Congratulatory letters and faxes are being received from around the world on the successful conclusion of UK Jalsa Salana expressing the benefits derived from watching the proceedings on MTA. Real benefit and beneficence of Jalsa can only be attained when whatever is seen and heard is made a source of spiritually adorning one’s life. Certainly no political or worldly matters are discussed at Jalsa, in fact when some distinguished non-Muslim or non-Ahmadi guests briefly address Jalsa most of them are mainly impressed by the spiritual atmosphere of Jalsa and base their comments on the teachings of the Jama’at. Jalsa is of course truly beneficial when all that is heard is put in practice by members of the Jama’at. Otherwise all the praise extended by the guests will be about something superficial. There needs to be uniformity between the inner and outer self of true believers. The world has started noticing us. Ahmadis as well as some non-Ahmadis around the world watch Jalsa proceedings on MTA, in particular Jalsa UK is watched in-depth. Hundreds of thousands are spent on MTA so that every member of the Jama’at has access to our objective. Our delight should not be limited to attending Jalsa and watching MTA broadcasts. Those who attend it in person and those who watch it around the world should practice what they hear at Jalsa in their lives and should be grateful to God that in this age of materialism He has made a worldly source a means of betterment for us. Betterment in terms of knowledge, practice and creed. It increases our faith when various means of communication and media work for us. This is something which was foretold 1400 years ago that certain inventions will assist faith. This should make us turn further to God and be grateful. God states: ‘…If you are grateful, I will, surely, bestow more favours on you…’ (14:8). The subject of gratefulness shows one the ways of gratitude to God as well as gratitude to man. As the Holy Prophet (peace and blessings of Allah be on him) said one who is not grateful to man is also not grateful to God. Jalsa volunteers were enabled to organise and carry out a vast number of departments, including MTA. These volunteers were men, women, children the elderly and youngsters who tried their best to serve. These volunteers come from different walks of life and include CEOs, doctors, engineers and other professionals but they carried out duties which may be far-removed from their day jobs. Some of them happily stand and attend to hundreds of huge pots of food cooking on fire, even teenagers do this work cheerfully. Groups of men and women clean toilets most selflessly, others drive the elderly and disabled in buggy carts from one point to another. Children serve drinking water in the heat while groups of men and women serve food to the guests. There is also the very important and extensive department of security. In short each volunteer whether or not he is familiar with a particular task, carries it out with great passion and to the best of his ability. There is also the task of winding up post-Jalsa. There has been a lot of rainfall after Jalsa which has impeded this task somewhat but Khuddam are carrying out the work just as they carried out the installation of Jalsa beforehand. The winding up task is quite critical as it has to be done within a certain time span given by the local Council. Any breach of this could make difficulties in holding Jalsa at the site the following year. This year Khuddam from Canada have joined the UK Khuddam in the wind up task and have helped a great deal. They also deserve our thanks. We are indeed grateful to all the volunteers, men and women alike, indeed they are deserving of gratitude. On behalf of the volunteers Hazrat Khalifatul Maish also thanked Jalsa guests and said there were just the odd few complaints received this year. Many dignitaries came to the Jalsa and expressed their appreciation. God covers our weak points and the guests only see the positive points. A minister from Uganda said that he was amazed by the organisation of Jalsa and felt that those serving appeared like angels. Even if something was asked of them umpteenth of times, they complied cheerfully. Praising various exhibitions at Jalsa he said that the way the Jama’at is working it will be triumphant in the world in the next few years. He appreciated the message of peace given at Jalsa. A judge from French Guyana said that when he came to the Jalsa he had pain in one leg which miraculously went away as soon as he came to Jalsa. Chairman of a Nigerian TV station who has been to Hajj said that he felt he was in the plain of Arafat. He said he had never seen a sight like this before and found the level of obedience to Hazrat Khalifatul Masih peerless. A judge from Congo said that being a judge he had the insight to discern the truth from pretence. He said he found the Jalsa to be a demonstration of what he had heard about the Jama’at and found it a true picture of Islam. Vice President of Sierra Leone said that the Jalsa was a great occasion. A mayor from Sierra Leone said three days of Jalsa were steeped in spirituality and caused to bring about a revolutionary change in him. Deputy Minister of Sports of Sierra Leone said Jalsa was an amazing experience. He said he had never seen guests honoured as they were at Jalsa. The speaker of Benin Assembly said he observed the great love Ahmadis have for their Khalifa. He said wherever he looked he found the organisation to be super and in spite of the huge numbers attending Jalsa the organisation was excellent. This was an exceptional scenario. An Ahmadi from Argentina said that he had been looking for the true faith for the past ten years and he has now found it. He was most impressed by Jalsa organisation in particular the involvement of youngsters. He took part in International Bai’at and said those were the happiest moments of his life. He was delighted to be the first Ahmadi from Argentina. A guest from Japan said that the hospitality and the service of the volunteers of Jalsa will be an unforgettable memory for him. He said Jalsa was a true model of UNO with people from all over the world coming together. Another Japanese guests said he has been looking at different faiths for the past ten years. He was given a copy of ‘The Philosophy of the Teachings of Islam’ during Jalsa. He said once he started reading it he could not put it down and stayed up all night to finish it. After finishing the book he felt he had found the true faith. He took bai’at the day after Jalsa. A university professor from Japan said he is researching Ahmadiyyat and has also been to Rabwah. His hosts in Rabwah asked him to forgive if there had been any deficiency in their hospitality. He said he felt the same excellent tradition at UK Jalsa. A member of Spanish National Assembly said that seeing Jalsa organisation he wondered how his people would cope if they had to organise something on this scale. After the three day event he repeatedly said world governments could not do what Jalsa volunteers managed. A lady MP said Ahmadis are working tirelessly for peace. Speaking in historical context of the once Muslim rule of Spain she wished to tell Hazrat Khalifatul Masih to consider Spain as his home when visiting it. A large family had come from France most of whom had done bai’at. Their father, who had not done bai’at, was most impressed at Friday Prayers and said he realised after coming to Jalsa why his children had accepted Ahmadiyyat. He said he had a dream in his youth the memory of which was triggered by attending Jalsa because it was about being in a place where many people had gathered. The father and the mother both took bai’at during the International Bai’at. A member of Greek delegation said he had never seen any other Muslim group to be so organised. He said everyone greeted each other with warmth and affection at Jalsa. A member of Slovenian delegation said that before attending Jalsa he only knew the Jama’at on an academic level but participation in Jalsa has convinced him that whatever he had read about the Jama’at was real, for example the practice of Love for all hatred for none. A university professor from Slovenia said this was the first time she had attended any Islamic programme and the introduction had been positive. She was impressed with the dedication with which the youngsters served food and water to the guests. A police officer from Sweden said attending the Jalsa gave him an opportunity to observe message of Jama’at being put in practice. He said if our message reached Sweden he would resign from his work because policing would not be needed any more. A guest from Switzerland who came on the last day of Jalsa said he had been to many events all over the world but had never seen an event like the Jalsa. He observed how calm all volunteers were and no one showed any anger. Another guest from Switzerland said the most impressive part of Jalsa was the International Bai’at. A lady journalist from Jamaica said her camera man was quite nervous about coming to a Muslim gathering. Once at the Jalsa he wondered if all the love and care shown was real or pretence. At the conclusion of Jalsa he said he had no doubt that all the love and brotherhood was real. The journalist interviewed Hazrat Khalifatul Masih and promised to try hard to spread our message in Jamaica. A guest from Panama said she had never seen such peaceful atmosphere anywhere else. She was amazed by what she saw at Jalsa and said now she would fully defend any misconceptions about Islam. A lady guest from Kazakhstan said she had seen a lot of the world in her 75 years but saw real service to humanity at Jalsa. She said she felt spiritual freshness and strength after Jalsa. A student from Guatemala said the spiritual atmosphere of Jalsa had been a guidance. An MP from Croatia said it his first experience of being with a Muslim organisation. 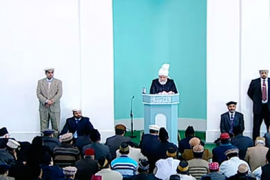 He said if the concluding address of Hazrat Khalifatul Masih was put in practice the world would become a cradle of peace. A journalist from Sierra Leone said the Jama’at had done him a favour by inviting him to Jalsa. He decided during the course of Jalsa to join Ahmadiyyat and took bai’at during the International Bai’at. An Ahmadi guest from Ivory Coast said he had been an Ahmadi for many years but had never experienced such a spiritual ambience before. A member of The British Society of Turin shroud said the forum at Jalsa was the best such forum he has ever attended and said that Jalsa gave him the opportunity to find out a lot about the Jama’at. An expert on of the Turin Shroud said one of the objects of coming to Jalsa was to inform Ahmadis about his research on the Turin Shroud but he felt he learnt much more from Ahmadis. With the grace of God the Jalsa was widely covered through the press and media department. Jalsa news, video clips, television and online coverage took the news to 3.3 million people. 2.79 million people heard about Jalsa on the radio whereas 7.7 million people read about it in the print media. Social media took the message to 5 million people. In total Jalsa news reached 12.63 million people. Apart from African countries the news was covered on TV in England, Scotland, Wales, Ireland, USA, Canada, Pakistan, India, France, Jamaica, Bolivia, Greece and Belize. The most important TV channel to cover the news was BBC News 24 which broadcast from Jalsa three times. French national news agency AFP also broadcast about Jalsa and their coverage was aired on various web sites including Yahoo News, NBS News and MSN News. 34 radio interviews were broadcast including one by BBC radio 4. A 20 minute long interview was broadcast. Caroline Wyatt of BBC interviewed Hazrat Khalifatul Masih. Catholic Herald published an article whereas two articles were published in Huffington Post. The message was also relayed via Twitter. All this was a result of the work of the central press team. It is believed that the UK Jama’at press team also worked at taking the message to at least 2 million people. Live coverage directly from Hadeeqatul Masih was provided by the following African countries: Ghana, Nigeria, Sierra Leone, Uganda and Congo. A Ghanaian listener called in and said he was a Christian but felt very emotional after watching Live Jalsa proceedings. He was convinced that Ahmadiyya Jama’at was at the forefront of representing Islam. He said it was his prayer to serve as a missionary of the Jama’at. A lady called from Ghana and said that she was a Muslim and after seeing Jalsa coverage she wanted to become an Ahmadi Muslim. A viewer in Uganda was so impressed by Jalsa coverage that he went to Ahmadi mission house and took bai’at. A caller in Ghana said the Jama’at represented true Islam. An Ahmadi lady from Ghana called and said she was delighted to watch the proceedings on TV. Sierra Leone national TV also covered Jalsa proceedings Live. A caller thanked all those whose work enabled him to watch Jalsa and made him feel as if he was present at Jalsa. The proceedings were shown in four cities of Congo. In Kinshasa only two hours of broadcast was planned but the concluding address of Hazrat Khalifatul Masih overran and the television station took the unprecedented step of increasing the Live broadcast time until the address finished. This received positive feedback. 10 million people listened to Jalsa proceedings on the radio in Congo. Press and Media team and MTA have worked very well especially the person in-charge of African transmissions. With the grace of God the coverage was very widespread. May God increase the capacities of the young people working in MTA and the Press and Media team. Complaint was received that there was a lack of chairs in the main marquee and some ailing guests did not get chairs because younger people had occupied them. Allocation of chair passes should be in accordance with numbers of chairs provided. Either more space for chairs should be provided or a separate marquee should be organised for the elderly and disabled. There should be more than one screen. Generally speaking the toilets were well looked after but there were a few complaints about lack of water and tissue paper. Non-Pakistani guests complained that Pakistani guests did not show patience in bazaar area where queuing was required and there was some pushing. One of the objectives of Jalsa is to show patience and tolerance and give others their rights. The transport system was generally praised but the workers complained about a few guests. No matter who the guests are, family of office-holders or family of Hazrat Khalifatul Masih, it is the duty of everyone to do as the workers say. The young people who were on duty became emotional and said they would rather not do duty if people did not listen to them. This is also not right. Workers should show patience and report to their superiors to deal with the situation. With the grace of God Jalsa brought many blessings. May each person who was present at Jalsa or saw it on television bring about a change in himself and may those who got the message via media have the wisdom to understand it and then accept it. Funeral Prayer in absentia was announced for Syeda Farida Begum Sahiba, wife of Sahibazada Mirza Rafiq Ahmad Sahib. She passed away three days ago. She was a daughter-in-law of Hazrat Khalifatul Masih II (may Allah be pleased with him).